Adam Palmer, an investigator with the Hidalgo County Sheriff's Office, testifies in the Monica Melissa Patterson capital murder trial in the 370th state District Court on Thursday, Oct. 26, 2017, in Edinburg. EDINBURG — Much of the weekslong Monica Melissa Patterson trial has thus far focused heavily on the theft and misapplication of a fiduciary charges she faces and less on the more serious allegation of capital murder. Thursday was not the exception. 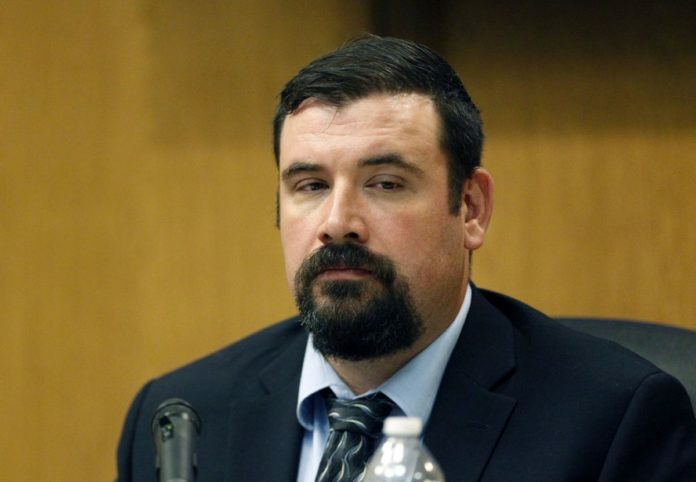 Testimony from Hidalgo County Sheriff’s Office investigator Adam Palmer, who was called to the stand to detail his investigation into Patterson, highlighted bank transactions that prosecutors believe support their case that the defendant allegedly helped kill 96-year-old Martin Knell Sr. to access his estate. The prosecution also alleges that Patterson, 50, was stealing money from Comfort House in addition to participating in Knell’s murder on Jan. 28, 2015. She served as the nonprofit hospice center’s administrator from early 2014 until her August 2015 arrest. On Thursday, Palmer put the amount of stolen funds at approximately $200,500, much of which Patterson is accused of spending on a variety personal expenses for her family and friends. Before he took the stand, prosecutors and defense attorneys argued whether Palmer should share data and images obtained from CellHawk — a mapping tool the sheriff’s office employs to analyze cellphone records — to the jury. Jurors were not present for this discussion. Robert Callaway of the Texas Rangers, who investigated the case with Palmer, previously testified in front of the jury that CellHawk analysis had put cellphones belonging to Patterson and her co-conspirator, Angel Mario Garza, in the vicinity of Knell’s residence on the morning of his death. District Judge Noe Gonzalez ruled that Palmer could talk in general terms about CellHawk, but could not show jurors any of its time-lapse simulations or photographs. Palmer, who will return to the stand Friday, did not discuss this part of the investigation in front of the jury, but he did mention other phone records belonging to Patterson. These included her phone and text conversations with Heriberto “Eddie” Suarez, a former San Juan city commissioner, on the morning and afternoon of Knell’s death. Suarez was called to the stand in the third week of a trial that began in late September. When the prosecution questioned him about his knowledge of Patterson’s involvement with Knell’s money, Suarez said he couldn’t remember anything despite being shown photographs of his text conversations with the defendant. The messages that Palmer photographed, however, were not shown to jurors. The HCSO investigator also detailed transactions Patterson made in the wake of Knell’s death, after she transferred approximately $232,000 that remained in his bank account to a new account under her name. These included large cash withdrawals and cashier’s checks, in addition to a $25,000 payment to a local construction company. Jurors previously saw photos of a residence belonging to Patterson that was under construction. She also deposited approximately $140,000 in the account of Jones, Galligan, Key & Lozano LLP — the law firm representing Patterson in a civil lawsuit with Knell’s family contesting his will. The subject of Knell’s safe deposit box, which has come up throughout the trial, returned Thursday. Palmer testified that he believed Patterson accompanied Knell to his bank on Jan. 13, 2015, to put bundles of cash amounting to $235,000 in the box. These bundles were addressed to specific people; among them were Knell’s former pastor, Comfort House and his caregiver Celestina Mascorro, who is considered the sole witness to the alleged murder. Jurors previously learned that $44,485 was missing from these bundles, according to the remaining amount not adding up to what was labeled on the bundle straps. Palmer reasoned that Knell likely did not prepare these bundles himself since they contained name cards that were typed, yet neither a computer or printer was found in the victim’s home. A filing cabinet was also determined to be missing when investigators visited Knell’s residence during their investigation, at least according to indentations found on the carpet where it was once located. The cabinet came up in Mascorro’s testimony, as she alleged that Knell demanded Patterson return to the keys to the cabinet on the morning he died. During the search warrant, Palmer told jurors he also stood in the garage and could hear other investigators speaking in the kitchen. Mascorro testified that on the morning Knell died, she heard Garza “smother” him while she and Patterson were in the garage. As testimony neared the end of the day, Palmer’s account of his investigation also touched on the compromised settlement agreement Patterson signed with the Comfort House board following her arrest for capital murder. The agreement, in which she reimbursed the nonprofit for $70,000 of disputed expenses, has been discussed often throughout the trial. After jurors were dismissed for the day, Gonzalez reiterated to both the defense and prosecution that there is “no room for argument that a settlement of a civil matter resolves a criminal matter.” The judge was referring to Patterson’s theft charge, which carries a potential punishment of five to 99 years if convicted. “The only way that can occur is if the district attorney’s office or the prosecuting attorney for the county … was privy and party to the agreement and there was some sort of exchange of immunity or something,” the judge said of what did not occur in this case. Friday will mark the end of the trial’s five weeks in court, as prosecutors have yet to rest their case and the defense’s opening statement is still pending.